Stage leaders Team Brunel continue to set the pace as they blast along at more than 22 knots, matching the wind for speed, and holding a narrow 15-mile jump on second-placed Dongfeng Race Team. 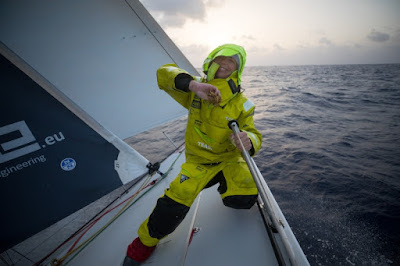 The top trio, which also includes Turn the Tide on Plastic, were less than 30 miles apart as the battle for Leg 8 supremacy continued on the tenth day at sea. Just over 2,300 miles remain between the leaders and the finish line.